The Ryan 92, designated VZ-3 by the Army in June 1956, was intended to be a reconnaissance and liaison aircraft able to operate from unprepared surfaces. It had a 28 ft metal fuselage and was powered by a 1,000 shp Lycoming T53-L-1 turboshaft engine driving a metal three-blade Harzell propeller on each side. The propellers were situated ahead of and below the wing, so the majority of the propeller slipstream flowed directly into the bucket formed by the extended double flaps and were turned downward for vertical lift. Differential propeller pitch was used for roll control. 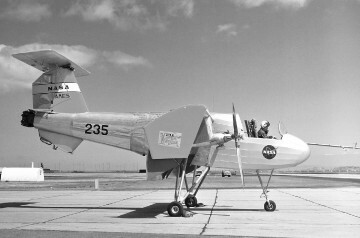 Engine exhaust was used at the tail for pitch and yaw before aerodynamic controls were effective. Ryan began taxiing trials on 7 February 1958. After extensive wind tunnel tests and aircraft modifications the first flight was made on 21 January 1959. The engines were unable to provide sufficient power to hover without a head wind. An accident the next month grounded it for repairs until its first test by NASA in February 1960; unfortunately the pilot ejected after an unplanned maneuver. It was again rebuilt to flying status: modifications after the crash led to a fabric nose section, an open cockpit, and a different landing gear. It continued flying in 1961, testing low-speed V/STOL handling characteristics. 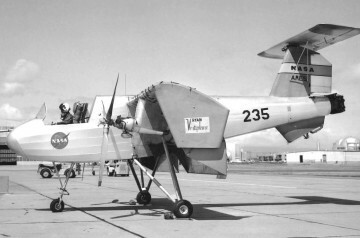 Resources related to the Model 92/VZ-3 Vertiplane, provided by the Vertical Flight Society. Resources related to the Model 92/VZ-3 Vertiplane, provided by public sources across the internet.